We’ve had some great meetings this season – why not join us next time? For our last meeting of the 2016-17 season, we welcomed Peter May, pinotage specialist and author of Pinotage, Behind the legends of South Africa’s own wine. He is the founder of the Pinotage club at www.pinotage.org and an Honorary member of the Pinotage Association. He has judged the Veritas and Pinotage Top 10 wine competitions in South Africa and the International Wine Challenge in London. His investigations have taken him from South Africa’s Cape wine lands to California, Canada, France, New Zealand, Texas, London and Virginia. Hungary has one of the oldest viticultures in Europe – Although most grape wines are presumed to have been introduced to the fertile lands that lay along both sides of the Danube by the Roman conquerors, the Hungarian language testifies to an even more ancient tradition. The Hungarian word for wine is the only one in Europe that does not derive from the Latin ‘vino’, proving that ‘bor’ (the Hungarian word for wine) was made by this nation even before Roman times. Indigenous keen: Hungarian growers (and consumers) are keen on their indigenous varietals, making Hungarian Wines even more exciting. Phylloxera devastated the vineyards here as anywhere else on the continent. When renewing the vineyards, well known world varietals were introduced in fair number. You will find your usual merlot, cabernets and pinots here, even if combined with the local soil, these grapes may surprise you once they are turned into wine. Furmint, Irsai Oliver, Juhfark, Kadarka, Kekfrankos are just a few local grapes that are fast becoming the talk of the town, raising the interest of both sommeliers and wine experts seeking the unusual. 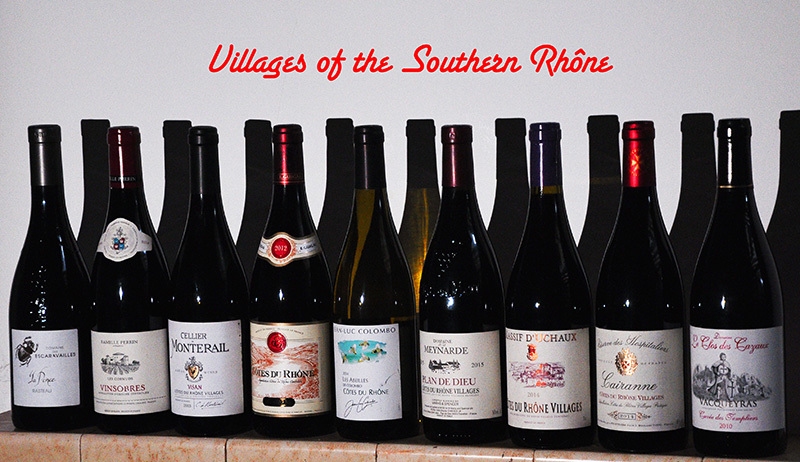 The Rhône Valley has the second largest production of wines, by volume, in France, being exceeded only by Bordeaux. Of this, three million hectolitres (400 million bottles), almost 20%, is exported to the UK and we should be grateful to our wine buyers for the general high quality on merchants’ shelves. However, for many of us who enjoy these wines, the escalating numbers of producers and regional names on the labels has become increasingly confusing, making it difficult to know if we’re getting value for money. 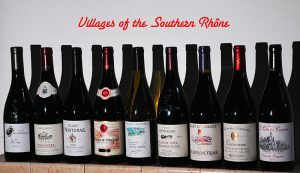 Focusing on the blends of the southern Rhône valley, David Carter has selected a range of wines to take us through “Côtes du Rhône”, “Côtes du Rhône Villages” and single “Cru” villages and give us an idea of how these different names affect what is in the bottle. Paul Mapplebeck kindle stepped in on the 3rd March to present a selection of wines from cooler areas of Australia. 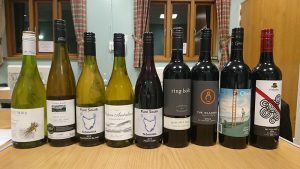 The four whites and five reds from across four Australian states, gave us an interesting selection of rather different Australian wines. For our February meeting, we were joined by Ian McLaren, Chairman of the Central London Wine Society, who presented a tasting of wines from Chilean wine producer Undurraga. 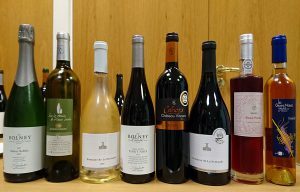 This offered an opportunity to try a whole range of Chilean varietals and blends from a single maker with holdings in many of the major growing areas. Undurraga was founded in 1885 and has been exporting since 1903. Over the years, the company has sought out the best sites for different grape varieties. This programme continues today with the TH (terroir hunter) programme, three wines from which are in the tasting. 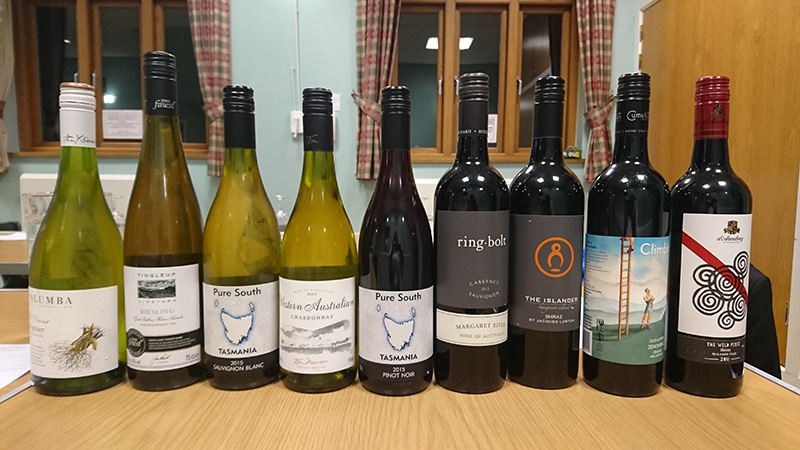 For our first meeting of 2017, we tasted some of the committee’s favourite recent discoveries, and believe we managed to positively surprise some of our members with our choices. Along with a fizz and a couple of lighter wines, we presented a selection of reds to warm the winter heart. For our Christmas meeting, we had a delicious food and wine tasting, presented by Douglas Harrison of Harrison’s deli on Pitshanger Lane. This special tasting was a gourmand’s feast, with wines and delicious seasonal nibbles such as jamon Serrano, quail Scotch eggs and a variety of seasonal cheeses. For our November meeting, we were joined by Jimmy Smith, who talked about the exciting French wine regions of Jura and Savoy (Savoie). Much of the wines from this region are drunk locally, or in the restaurants of Paris, so this should be an interesting tasting of a lesser-known region. Jimmy is an authority on the French wine regions. As well as teaching Wset courses he is involved in the French Wine Scholar programme. He particularly enjoys introducing people to regions and wines which are less famous within the UK market. There is more to Puglia than cheap and cheerful Primitivo! Come to taste some of the delights of the region with us on October 14th, and discover fresh and fragrant Bombino, velvety Falanghina, spicy Nero di Troia, and muscular Negroamaro. Gilbert Winfield, Puglian evangelist, guided us through the unknown delights of the heel of Italy. For our first meeting of the 2016-17 season, we welcomed back Red Squirrel wines. Austrian Wine has a burgeoning reputation for some of the most exciting reds and white wines in the world at the minute. Red Squirrel imports directly from some of the brilliant up-and-coming winemakers in this diverse wine country. Explore both Austrian reds and whites from numerous regions and some very rare grape varieties of course – after after all they are Red Squirrel Wine!